Hundreds of Syrian children have been killed by conventional weapons. So why are chemical weapons worse? Philosophy professor Michael Labossiere argues that using chemical weapons as a 'red line' is more about psychology than ethics, and says it implies killing children with bullets and bombs is tolerable, while gassing them is not. This week, the United States attacked a Syrian air base, in response to the Syrian government's alleged use of chemical weapons. The attack is a change in approach for US President Donald Trump, whose previous statements suggested he had no interest in attacking Syrian forces. Trump said the suspected use of chemical weapons, especially against children, compelled him to act. When you kill innocent children, innocent babies, babies, little babies, with a chemical gas that is so lethal people were shocked to hear what gas it was, that crosses many many lines beyond a red line. Many many lines. - United States President Donald Trump. But this is not the first time children have been killed during the Syrian civil war. 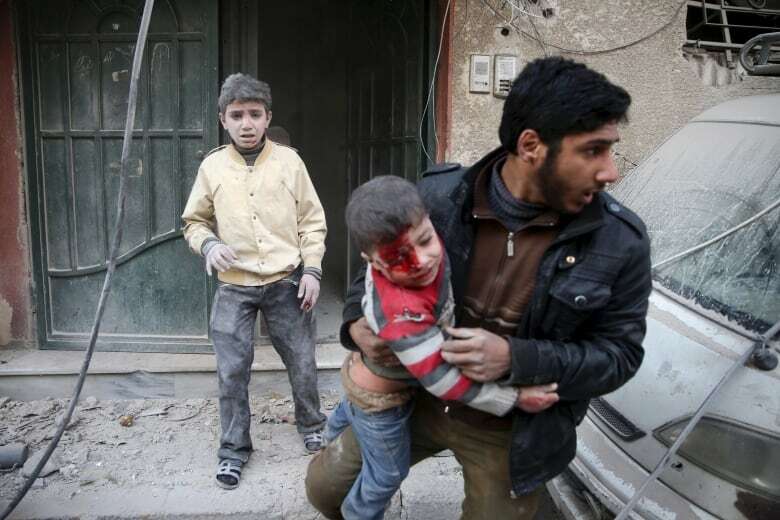 According to UNICEF, more than 650 children were killed in Syria last year alone. That includes children killed by conventional weapons: mines, shells, and bombs. Philosophy professor Michael Labossiere argues that it's inconsistent to treat chemical weapons as a 'red line,' when a government is already capable of causing death and suffering using conventional weaponry. Labossiere teaches at Florida A&M University in Tallahassee, and blogs at talkingphilosophy.com . To him, using chemical weapons as a 'red line' is more about psychology than ethics, and implies killing children with bullets and bombs is tolerable, while gassing them is not. "The usual claim is they don't merely kill people, like a bullet would or an artillery shell or a hellfire missile, it's that they inflict terrible suffering. So we could make a good case that if the method of killing is worse, there is more suffering and more torment, that would make it legitimately morally worse. Now in terms of replying to that, there are normal weapons that do things that are pretty horrific as well. So if someone is killed by poison gas quickly, that's less awful than say being hit with napalm and being burned up badly and dying over the course of several hours. So the argument that chemical weapons is more awful is relevant, but it's not the chemical part, it's the awful part. So being a chemical weapon itself doesn't necessarily make it worse, it's the suffering that matters." "I would say the moral red line should be the killing of people, rather than killing them with chemical weapons. The distinction between not killing people at all and killing them, is far greater than the moral distinction between killing people with conventional weapons, and killing them with chemical weapons. So if morally we say 'it's okay to have war and kill people,' once we accept that then say 'it's not okay to kill people with chemical weapons, that's a special red line' that seems morally problematic." "They treated me like crap, and I know it was because I was Native"